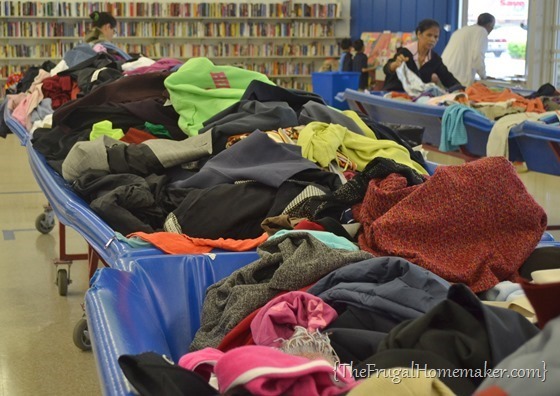 When I was in NC last week, I told my friend Molly that the one thrift store I wanted to be sure to visit was the one she had talked about where you dig for clothes in bins and pay by the pound. I had never been to a Goodwill store like that. But I was super excited to go. I have a fabric outlet store near me that does a fabric by the pound sale twice a year and it is a ton of fun and I get GREAT deals, so I knew I would LOVE shopping a Goodwill like that. 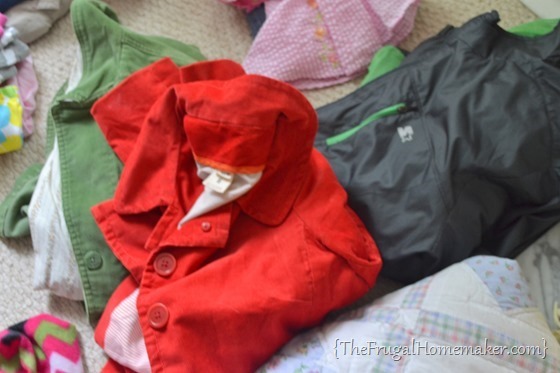 So here is the deal – ALL clothes (from newborn to adult, pajamas to jackets, underwear to socks, shirts, pants, etc. are all piled up in these waist high bins. So you aren’t digging down to the floor and it does make it pretty easy to search through the clothes. There are tons of these bins, 20-30 all spread over the store. Shoes were in the back on shelves. See the blue trashcan looking things in the front of the picture? That is your shopping cart! They are on wheels and you push/drag it through the store filling it up with all your “treasures”. I do have to mention this – Molly had told me all about it before we got there. When they bring out a new bin, you have to stand behind a line and wait until they get it locked in place. When they do, they say “Go” or “OK” or something like that and there was a HUGE rush of like 20 ladies that ran in and started tossing clothes left and right! Hilarious! I tried to get more pictures but one of them said to stop. We spent well over an hour digging in bins, browsing through the housewares, and honestly could have spent another 30 minutes looking in bins we didn’t even get to. Then we went through our “shopping bins” to make sure we wanted everything/check for stains, etc. There is my bin all ready to check out. 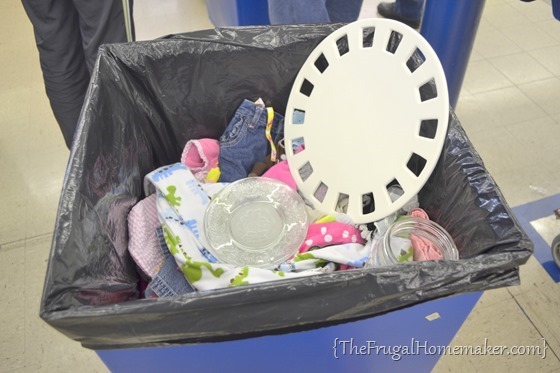 The housewares were calculated separately, then they rolled the bin on the scale and I waited to see how many pounds I had! 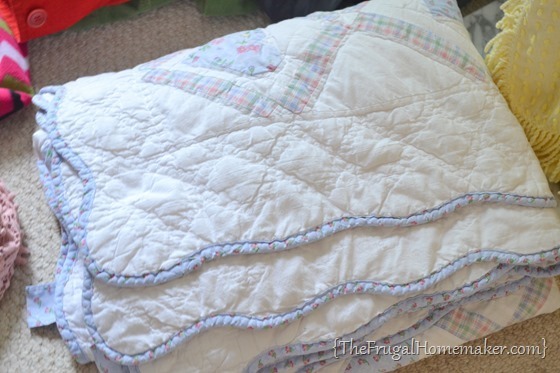 BUT, in those 19 pounds of clothes was a full size quilt which I weighed at home and it was around 2.5 pounds. So I paid $3.50 for it. And got 58 pieces of clothing/hats/scarves for about $22.50, which equals $0.39 a piece! 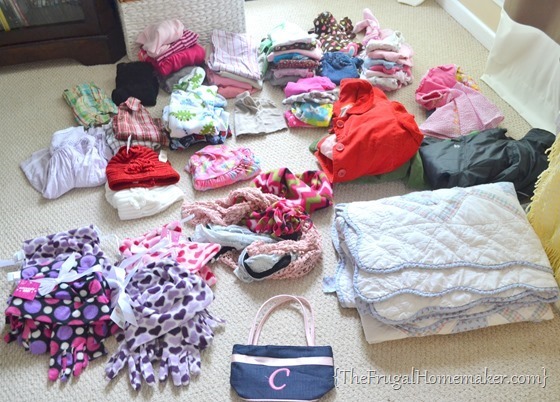 A bunch of newborn clothes for a family in our church that just had a little girl – 2 NB pants, 8 NB sleeper/onesies, 4 NB dresses, 5 NB pants, 1 NB tights. 2 women’s jackets – one was J. Crew brand! 1 men’s Starter jacket, 3 women’s scarves, and 1 girls purse. 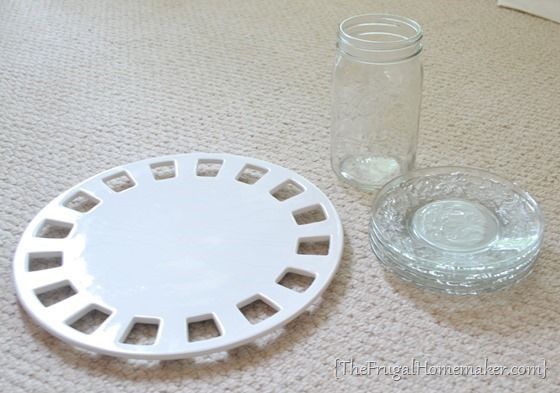 The cake plate was $0.49, the mason jar was $0.47, and the glass plates were $0.47 each. 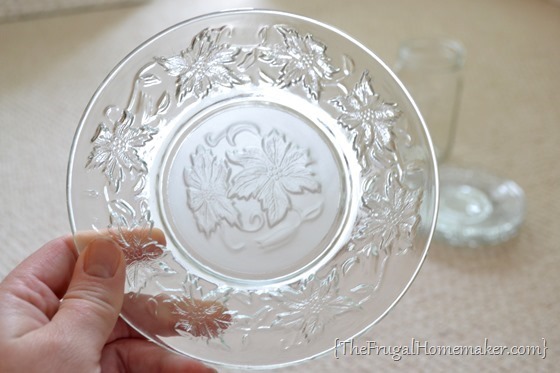 I was really excited when I saw these glass plates. They are Princess House plates (which I own a lot of because my mother-in-law sold it for years) and a set of 4 would cost $40.00, I got 4 for $2.00. My husband and Molly’s husband asked me what I thought about it when we got back and I said, “Of course I LOVED it and am ready to go back already!” This is the type of store that if you were looking for clothes, you could literally shop multiple times a day and find new things because they are changing out the bins constantly. We had a TON of fun and lots of good memories!! 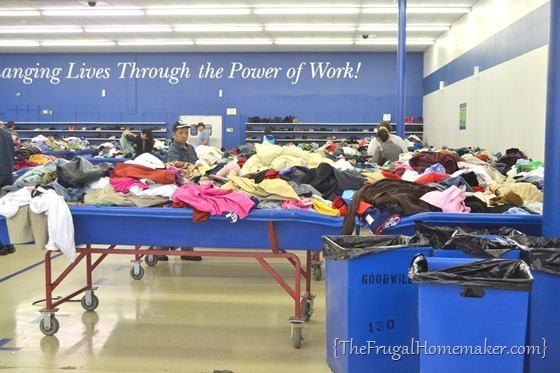 Here is a site I found that lists Goodwill outlet or clearance centers by state – http://frugalliving.about.com/od/bargainshopping/qt/Goodwill_Outlet.htm. I specifically know of ones in Greenville, SC; Charlotte, NC; and North Charleston, SC. 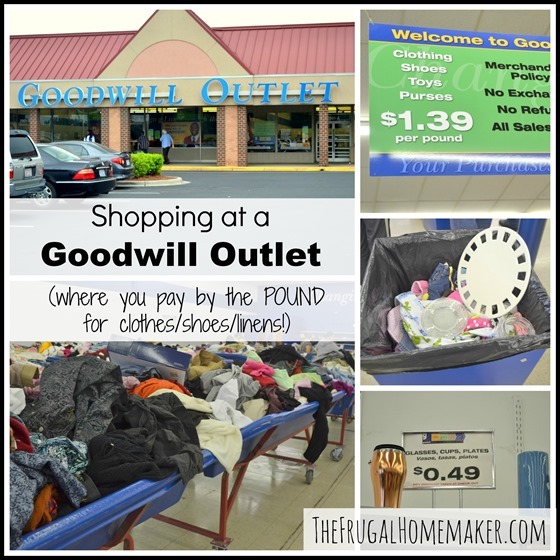 Have you ever shopped a Goodwill outlet/clearance center? 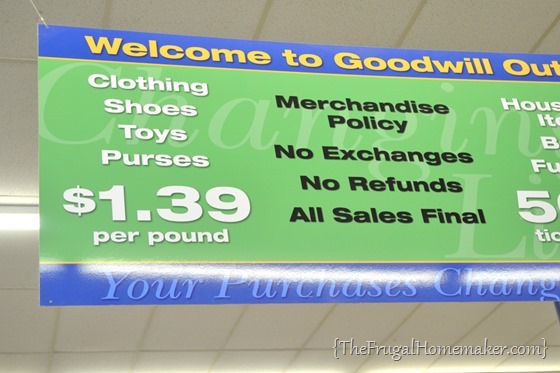 What do you think – would you want to dig for clothes and pay by the pound? The cake plate looks like a Southern Living at Home plate. I have one just like it and it’s great for decorating! Well, you have to get past the smell first and around here serious shoppers wear disposable rubber gloves to sort tru the bins. There is some nasty stuff that gets thrown in there. But it is usually worth the time. As soon as I saw those cake plates I knew they were princess house. (I also have a ton of princess house) My mom had parties all the time, so both my sister and I have a lot of it. (love it) and my mom even sold it for a while. What a great price on those plate!!!! I love that cake plate! Sounds like a fun trip. I hope you will link up again. I’ve decided to run the party every Monday for now. 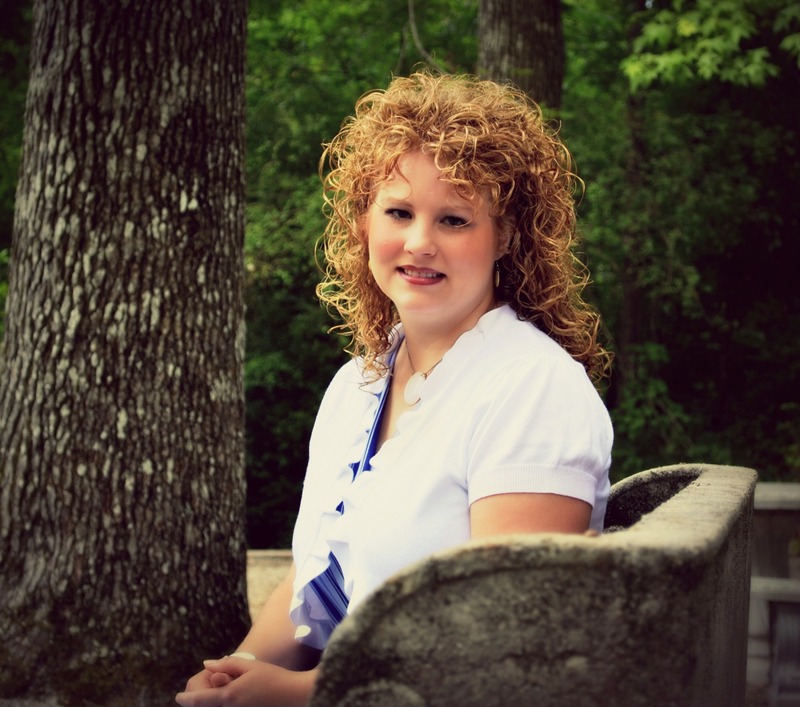 The one in Greenville sc is a good one….only thing ..shoes and books are in bins, too. So that makes shopping a little harder! 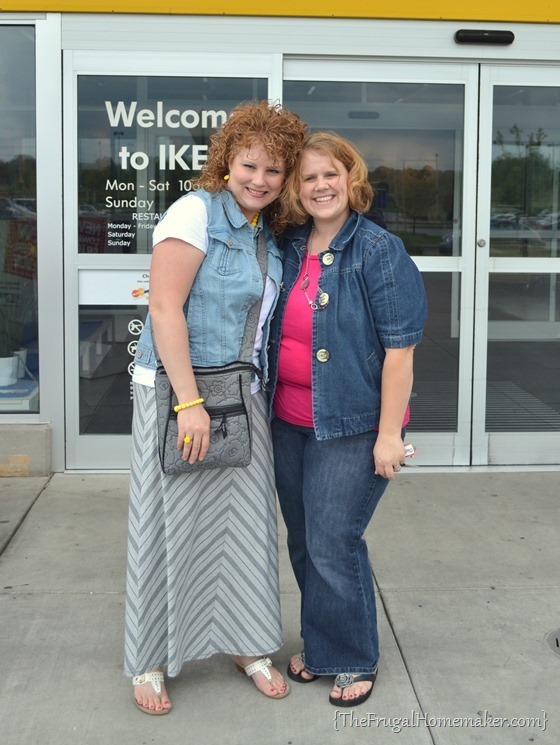 Have you been to the Greenville store? No! But I would love to go the next time I go through Greenville. There is one in Columbia, SC. Really? Where? We drive through Columbia on our way to Charleston and often stop there. Would love to stop at the Goodwill outlet! It is in West Columbia, SC. It is near Zesto’s and Bojangles. thank you so much!! definitely will check it out next time we are through there. There is one in Winston-Salem,NC as well. 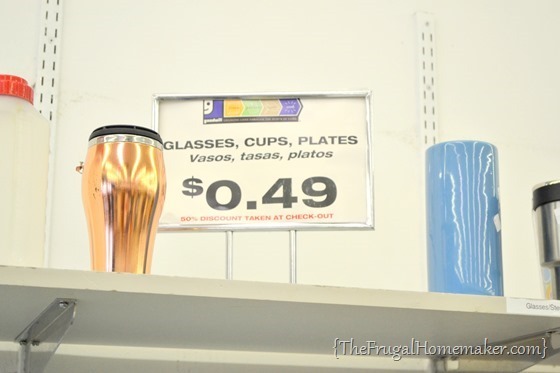 Clothes are 1.10 pound glassware dishes and etc .59 a pound. I would love to shop in one of those goodwill outlets, I’ve heard the one in Winston-Salem changed their prices and they do not sell by pound anymore. Can anyone help me to know if its true? I am planning to go, and make my 2 hours travel worth it. I was just at the Winston outlet a few weeks ago and they still sell by the pound! They charge $1.25, still the cheapest per pound store I have found. I am going back in two weeks as I have found a new addiction and I really enjoyed the shoppers at the Winston store, Charlotte is a bit of a madhouse but they have some great finds at that store as well! Hi ! 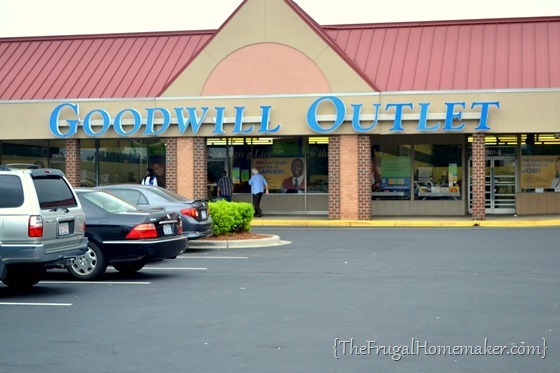 I’m very interested to go check out the Goodwill Outlet Store!! I can’t seem to find one in Ga 🙁 can you help? I want one near canton GA. (Zip.30114)Please & Thank You!!!! sadly I don’t think there are any in GA. 🙁 I am in GA too outside Atlanta. I think the closest one would be in Greenville, SC. There is also on in Charlotte, NC. 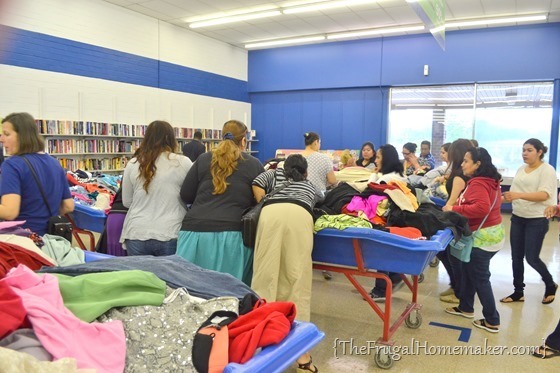 I would google – Goodwill outlet and see if you can find anything but I have searched several times (and checked the link I posted in the post) and can’t find any in GA.
My family shops for almost all of our clothes at the Goodwill Outlet in Greenville SC. Find so many great things. In fact we were trying to find a home church and after visiting one Church several times we noticed the teens at the church were not talking to my teens. Finally found out that the teens thought my kids were stuck up “rich” kids because they only wear brand name clothes. All of which actually came from a by the pound Goodwill!! Hello, just so that yall know, I was just at the phoenix one. And theyve got tons of stuff there for $1.09/lb. They do rotation every 30 minutes. Also one in denver. I a truck driver so, when I see thenm I stop and shop. Any locations in texas, or tennessee? Anyone, anyone? Also, for the lady asking about a location in Atlanta, you might want to check out the daily salvation army auctions downtown. I’ve been to the Goodwill Outlet Store in Asheville, NC. LOVE IT!!! I wish you would have included an address or at least a road/street name for the Charleston, SC, store. I’m new in the area and love thrift stores. The pound store in lexington county in SC on meeting street has a fabulous merchandise. Sunday are half off!!! We briefly had one in Orange Park, FL, but it closed this week. I suspect the building sold or they were too much competition for regular Goodwill, although any thrift store has nicer stuff. Our pound stores was an old Goodwill store that had moved, but the building was for sale. Suddenly a pound store opened, but the building had a for sale sign. I’ll have to check if it still has that sign. I’m going to miss that store, the best treasure hunt around. I know this is an old thread but what is the location in Orange Park? The Greenville, SC outlet store is also $1.40/per pound regularly, but on Wed & Fri nights from 6-9 PM and all day Sunday it is half price so $.70/per pound. Does anyone know if the Charlotte outlet store has discount days as well? I shop at the outlet in Asheville, NC. One time I got four beautiful plus size wool blazers ( 2 Pendleton, 2 Talbots) for a total of $6. Amazing. It’s like Christmas because you never know what you’ll find under an ugly shirt!!! FUN, FUN, FUN!! Lots of fun at the one near Pgh Pa I wish there were more of them. Does anyone know if there is a Goodwill Outlet Store in or around Myrtle Beach, S. Carolina? I will be vacationing in a few weeks for a month, and, would love to shop there in one. We have several in Pa. and we love them. Does anyone have problems finding a cart to shop with?